One of my very favourite flowers is the ranunculus, which is from the same family as the buttercup. I was so happy when I went into my local florist this week and saw these beautiful pale pink blooms. They are very feminine flowers and remind me of 50s crinoline petticoats. I love the layers upon layers of soft delicate petals. Each day as they unfold, they look better and better, with the petals becoming more and more translucent. What is the Latin name? What is it commonly known as? How do you pronounce it? What does it look like? Layers of petals surround a small ‘button’ centre, which is usually green. 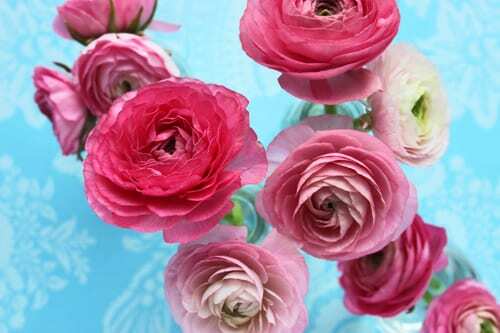 Ranunculus are available in a wide range of colours from pink, yellow, white, red, and orange to burgundy. When can you buy them? They are normally available in the winter and spring. Where can you buy them from? Florists, supermarkets and garden centres. How do you look after them? Remove the foliage. Cut the stems on a slant with scissors and place them in a clean vase with fresh water. There are also giant-headed ranunculus called Clooney ranunculus…nothing to do with the Hollywood actor George though! Also, apparently ranunculus take their name from ‘rana’, the latin for frog, perhaps linked to the fact that the plants like to grow in damp conditions. Do let me know what your favourite flower is? They’re beautiful – what a wonderful colour combination! I adore flowers, and am currently working on a series of white tulip paintings. Beautiful photo. Wish my camera took such great photos. My fave flower has to be the peony. Thank you Anna 🙂 I too love peonies…looking forward to them appearing in May!